We love our dogs, from whether they are roly-poly puppies or distinguished seniors with gray coats. As your dog gets older, they need special care and it’s extra important that you make regular veterinary visits. Here’s what you need to know to care for your senior dog. What risks do senior dogs face? As your dog ages, health issues may arise, including the deterioration of their skin and coat, loss of muscle mass, more frequent intestinal problems, arthritis, limited mobility, obesity, dental problems and/or a decreased ability to fight off infection. As your dog heads into their senior years, they may not be able to run as fast, jump as high or have the stamina they once had. Stressful situations and abrupt changes in daily routines should be avoided. If a drastic change must be made to an older pet’s routine, try to minimize the stress by introducing the change in a gradual manner. What qualifies as a senior dog? Dogs may begin to experience physical changes between seven and 12 years of age. Like people, each dog ages at different rates, so yours may stay spry well into double digits. Mixed breeds and many smaller dogs tend to live longer. A small dog of less than 20 pounds might not show any signs of aging until they are age 12 or so. A 50-pound dog won’t “seem” old until approximately 10. Larger dogs begin to show their age at age eight or nine. How do you exercise senior dogs? Older dogs tend to be less active than they were in their younger days. Degeneration of joints due to long-term wear and tear happens naturally, but can be exacerbated by obesity. Certain breeds are more prone to congenital issues like hip dysplasia, elbow dysplasia and rheumatoid arthritis as they age. When your dog is experiencing limited mobility as a result of age or obesity, you may need to adapt your playtime routine. While indoors, provide your senior dog with an environment full of both physical and mental stimulation to help them feel more youthful and active. Provide their treat toys (like a Kong) to dispense meals in smaller doses to improve both physical and mental function (by making them work for their snack) and to promote weight loss in heavier dogs. If you have stairs, ramps can help an older dog keep moving around the house without causing them too much pain. Keep your dog healthy with regular outdoor walks throughout the week. Several shorter walks might be a better fit for a senior dog. Find a comfortable distance for them to walk each day. Swimming is another option to help exercise older dogs without hurting their joints as they age. Though dogs with physical limitations may want to keep playing, chasing balls and jumping like they did in their youth, senior dogs may not have the stamina anymore and they may also be more sensitive to hot and cold temperatures. 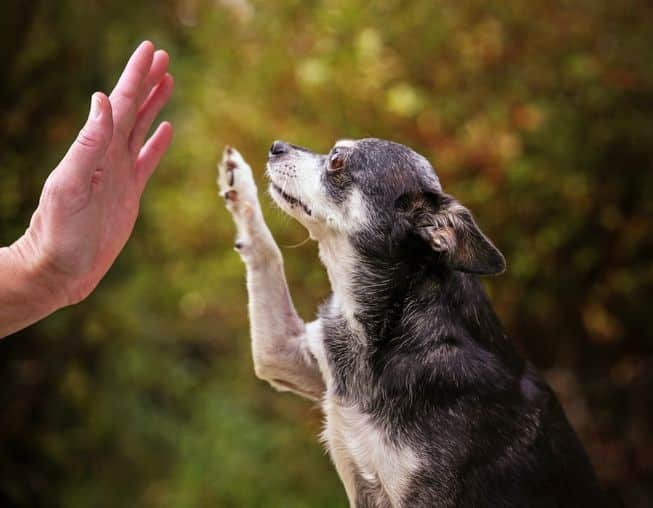 Before starting your senior dog on any exercise routine, check in with your veterinarian on how to safely be physically active and discuss how to work with any health issues they may have. What do you feed senior dogs? As dogs age there are metabolic, immunologic and body composition changes that follow. Some of these changes may be managed with their diet. Special senior dog foods help them maintain their health and optimum body weight, slow development of chronic disease and minimize current diseases. Importantly, studies have shown that the protein requirement for older dogs does not decrease with age. Feed older dogs diets that contain optimum levels of highly digestible protein in order to help maintain a good level of muscle mass. Older dogs may be prone to put on body fat, even if they eat less, due to reduced energy expenditure or a change in their metabolic rate. Feed your senior dog a diet with a lower calories to avoid weight gain. We may recommend increasing a senior Dog’s Gamma-linolenic acid (GLA) intake through food or supplements. GLA is an omega-6 fatty acid that plays a role in the maintenance their healthy skin and coat. Aging can affect a dog’s intestinal bacteria, which can result in symptoms of gastrointestinal disease. Senior dog diets should contain fructooligosaccharides (FOS) to promote the growth of beneficial bacteria. Antioxidants, including vitamin E and beta-carotene may help eliminate free radicals, the particles that may damage body tissues and cause signs of aging. A senior dog’s diet should contain higher levels of these antioxidants. A dog’s breed, size and health help your vet determine when it’s time to start buying senior dog food. Keep your dog healthy with routine care and veterinary exams to assess the presence or progress of any chronic disease. Does my dog need a coat? Seasonal sounds: What are your dog’s noise aversion triggers? Your pet is in good hands with our team of professional staff of groomers and trainers. We offer your pet only the a top quality service. Atherton, Belmont, Brisbane, Burlingame, Colma, Daly City, East Bay, Half Moon Bay, Hillsborough, Los Altos Hills, Menlo Park, Marin, Millbrae, Miramar, Montara, Mountain View, Pacifica, Palo Alto, Portola Valley, Redwood City, San Bruno, San Carlos, San Francisco, San Mateo, South San Francisco, Stanford, Sunnyvale, Woodside, Now in: Marin and East Bay!! !